Collards, also known as collard greens, are a member of the cabbage family. 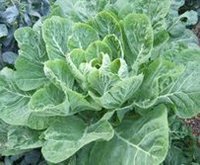 Collard greens have always enjoyed popularity in the southern states and lately its popularity has grown throughout the nation. Collards grow from a main stalk with leaves that grow outward on inedible stems. The smooth, green firm leaves should be picked from the bottom of the stalk, as the stalk will continue to produce greens well into late fall. Collards store better than most greens. Wrap unwashed leaves in moist paper towels and place in sealed plastic bag. They will stay fresh for 4-5 days in the crisper drawer of the refrigerator. When ready to use wash thoroughly. Like other cruciferous plants, collards have been shown to help protect against cancer as well as macular degeneration, an eye disease. Collard greens are "tough", so they are usually cooked, either by steaming or by cooking in soups, curries, stir-fries, or in casseroles.